A while ago I had a discussion with a colleague on what the structure of our code repository ought to be. At the time, I couldn’t find the words to explain why I prefer one strategy over another, so I’ve given it some more thought. 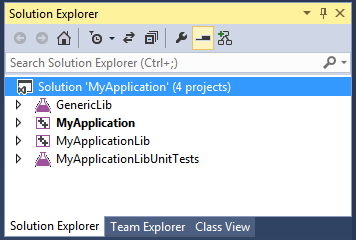 In this case we’re talking about several Visual Studio Solutions (.sln) and their C++ projects (.vcxproj). If I were to choose a directory structure, my considerations would be as follows. A solution contains projects that it may or may not own. I expect a solution like MyApplication.sln to contain a project MyApplication.vcsproj. The solution owns this project, the main project. The project could have dependencies on other projects of course. These dependencies are either specific for this project, or generic and reusable. The solution contains all projects that the projects it owns directly or indirectly depend on. I.e. My Applicaiton depends on MyApplicationLib, which in turn depends on GenericLib. The solutoin contains all three projects. It may seem obvious, but it’s quite common to find a project that depends on a library that is not included in the solution, causing a linker error unless you built this additional dependency manually beforehand. Not pretty. This entry was posted in Code on January 18, 2015 by admin. This entry was posted in Books, Code on November 16, 2014 by admin.